All of the great players that has been in an Cleveland Indians uniform is on the cover from. This program was available to buy during the 2001 season at Jacobs Field. 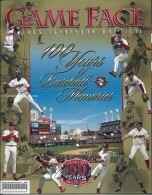 This Game Face program is dedicated to the best moments in Cleveland Indians history from 1901-2001. Larry Dolan is in transition to owning Cleveland Indians and appears in this issue. The Cleveland Indians lost opening day to the Chicago White Sox on April 2 with a 7-4 score. David Wells was starting pitcher for the White Sox and Bartolo Colon was the starting pitcher for the Cleveland Indians. If you have this program or want to get this program. You will want to look at the ads. The ads are always interesting and how advertising has changed. How Collectible is the 2001 Cleveland Indians Game Face | Opening Day cover? This Cleveland Indians program was the first issue of the 2001 and was sold during the month of April in 2001. This Cleveland Indians programis not a highly coveted Game Face program. This Cleveland Indians program is also affordable for all types of collectors. This Cleveland Indians program is special because it was made specifically for opening day.